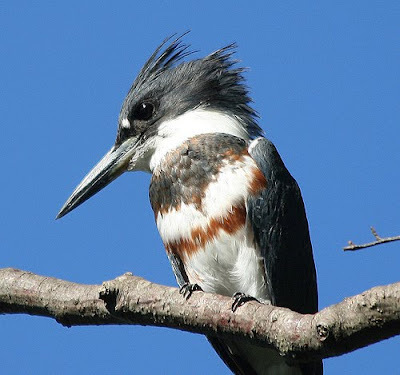 I saw my first 2 belted kingfishers today without even knowing as they squaked and flew by. I have only just made the ID from some blurry photos :) Then I saw my 3rd sitting on a wire in a totally different location and got some much better photos of it. As it turns out, it was very dark in colour like the one you have shown here. I was trying to figure out if that was due to it being a juvenile. Do you happen to know?